Granada, Spain is a very, very impressive place to explore. Whether you’re all about tapas and flamenco, shopping in the sun or visiting UNESCO world heritage sites such as The Alhambra Palace, Granada is a tourist-friendly for all. Forget the overcrowded Spanish coast and head inland to Spain’s culture rich cities. The region of Andalusia attracts people year round for a magnitude of reasons. For us, it was a last minute completely unplanned trip. A last minute flight took us to Andalusia for a mini road trip with my boyfriend’s family. An impromptu, last minute, culture filled road trip across Spain is not something I would ever turn down in a hurry. 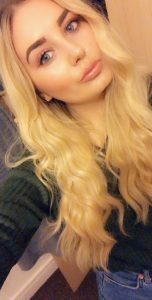 You’d be a fool to turn down such a trip. Within four days of the initial talks of our Spanish excursion we had our flights, Airbnb’s and rent-a-car booked for a short but packed Andalusia road trip. We started in Ronda and head down to Granada, then onward to Ojen to visit Jamie’s family. We’d finally return to Malaga via Marbella for our flight home 6 days later. A quick trip to enjoy everything Spain in all it’s cultural glory. We arrived in Spain and hit the road. We spent our time admiring the Sierra Nevada mountains, enjoying some traditional Spanish tapas, red wine and experiencing car sickness. The Nichols boy’s don’t really do winding roads. Something I later found out very well on a 6 month trip through Latin America with Mr Travel Sickness. Our time in Spain was an adventure from the second we entered Ronda. Our first stop led us to the Fiesta de Flamenco, a celebration that brought the town to a standstill. On to the coast were greeted by Jamie’s family in the hilly streets of Ojen and spent one evening in the cutest boutique hotel La Posada del Angel in the scenic white town. In the middle of our trip we found ourselves heading to Granada. A city that we were all equally excited to visit. Several hours on the road and a strange ‘is this a car park or a war zone?’ experience and we were unpacked and having a traditional Spanish lunch in an authentic Spanish Plaza with the sun beating down fiercely on us. We had arrived in our main destination, Granada. Granada embodies everything that is Spain, grand architecture, excellent places to drink, eat and socialise. And the main reason we chose to visit the city of Granada, The Alhambra. A UNESCO world heritage site that fascinated us from the second we heard its name. We booked our tickets for The Alhambra hurriedly online. There’s a few different ticket websites including Granada Tours. The tickets for the Alhambra sell out fast and often people are left outside queuing with no tickets left for that day. Its wise to pre-book Alhambra tickets online in advance or arrive in Granada a few days early to visit the ticket office at The Alhambra to buy your tickets. We decided that we wouldn’t be left waiting outside and we’d be seeing The Alhambra no matter what. 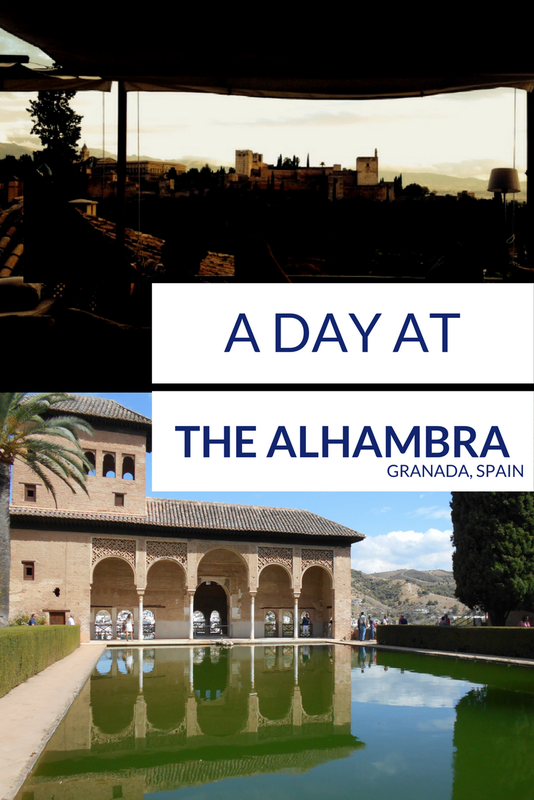 In our rush to buy Alhambra tickets we mistakenly booked a big package deal online, Jamie’s mum – the trip organisers and a fluent Spanish speaker was able to work her magic and fix this in time for our tour of The Alhambra. Check out a few different Alhambra ticket websites before booking yours or arriving in Granada, ticket prices are relatively similar but as we found packages vary. The mistake we made is a mistake that could’ve been costly to us in our crazed urgency to get tickets for The Alhambra. As mentioned try Granada Tours or Get Your Guide for tickets the websites are easy to use. The Alhambra is a palace-style fortress in the city of Granada, its situated in the hills and looks down on the city in all its opulence. 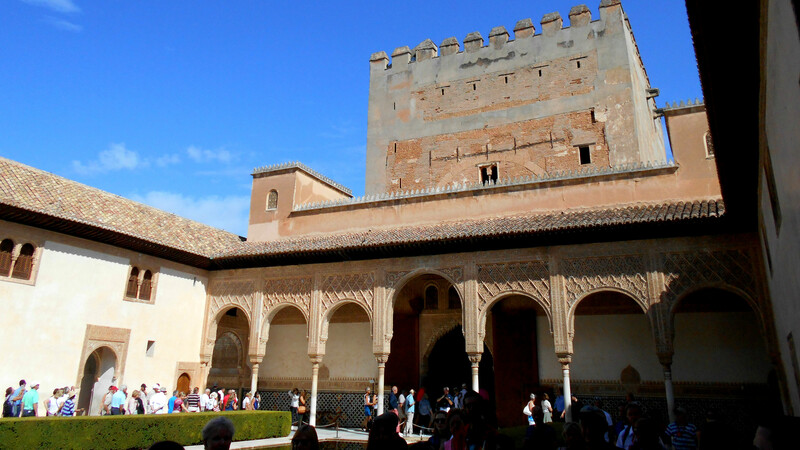 The Alhambra was once a small Roman fortress morphed into an Moorish palace. The structure itself has changed ownership and religions more times than I can keep up with. It’s turbulent history is what makes The Alhambra so unique and intriguing as a heritage site. The grand Islamic architecture is well preserved and incredibly beautiful to photograph. Each room tells and tale, each wall, floor, ceiling, window and door frame tell a story of a time from Spain’s history that many forget. The Christian influences intertwined among the Islamic architecture make the Alhambra a very special and thought provoking place to visit. The cost of visiting The Alhambra can vary, there are several varying tours with guides, with audio guides, with bilingual guides etc. and the prices seem to fluctuate depending on your requirement. The standard entrance Alhambra ticket is usually £35 which is around €40. Book your tickets for the Alhambra entrance and tour in advance and beat the masses waiting outside. We got one audio guide between four and one person was able to listen and then relay the information to everyone else. Other than our hotel in Ojen this trip was strictly Airbnb’s for us. A cheap alternative for four travelling Spain. 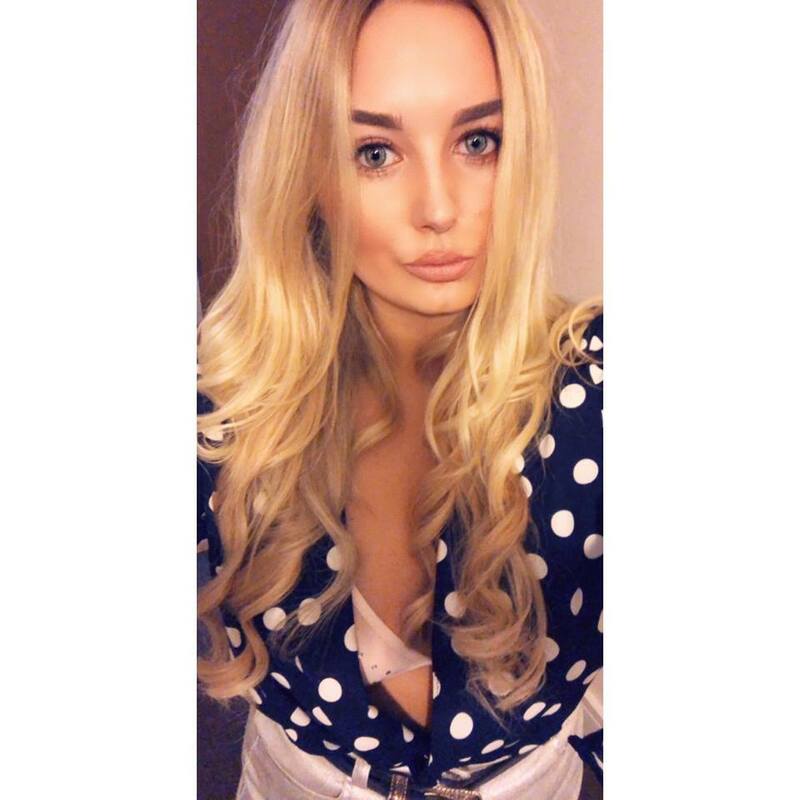 We were able to book two rooms, private bathrooms and often even whole apartments and a lower cost for the small number of nights we spent at each destination. If you have plans to do a Spanish road trip and time soon I fully recommend this option. Our Airbnb in Granada even had a private garden with plunge pool. What more could you want from a budget accommodation. Alternatively there are a range of backpacker hostels and budget accommodations throughout Granada and in Spain generally. If you’re a part of a large group and looking to splash out why not rent a villa in the hills overlooking the city? Granada pretty much has it all in terms of tourist attractions. We spent our days checking out churches, other Alhambra related attractions around the city – which were included in our ticket price (not the standard entry). We were able to enjoy a cold Cerveza or two in the sun and ate out every night in the many restaurants Granada has to offer. 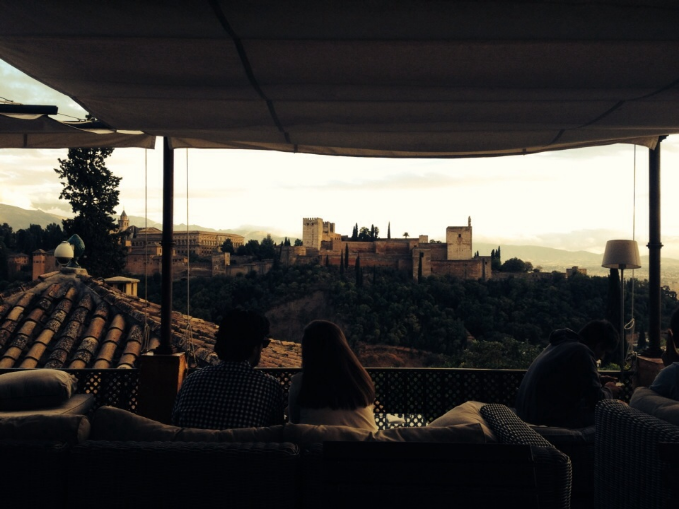 If there’s one thing you must do in Granada its visit one of the incredible restaurants overlooking the Alhambra. At sunset this is the most surreal setting. Carmen Verde Luna and Estrellas de San Nicolás are two of the most popular. Getting here is pretty impressive too, walk the steep and confusing streets of one of Granada’s neighborhoods to reach the higher points and the balcony-style restaurants. We also grabbed ourselves a Granada city tour, something I’m an always eager to do in any new city. Hop on the city bus or train and take a route around the city seeing the best sites and spots. City tours in Granada are the best option for anyone with restricted time like us. The cathedral can be seen from the bus but it’s probably worth hopping off to get a snap or two. I love the Alhambra! Such an amazing place. I seriously had never seen anything like it! I love Spain, but have not yet been to Alhambra. Not surprised it is so popular, thanks for the tip to book in advance. Hope to make it there someday. Previous Post Why visit Bratislava in winter?